Drakuli'c '(How We Survived Communism and Even Laughed, LJ 3/15/93) has a rare reporting talent. She observes country soil rising from beneath urban asphalt, and she knows how to explain to urbane reader the passions and desires of a marginalized Eastern culture. The specter of an international European community may be a mundane sidebar in Western newspapers, but for Drakuli'c it represents far more. Diapers, royalty, Bucharest toilets, and presumptuous cafes serve as apocryphal symbols in her collection of political essays. To the daughter of an antifascist hero, the West represents the realization that money can transcend the future and that there is more to life than the "living in the present" that communism offered. Rather than using the language of traditional economic and political analysis, Drakuli'c offers the language of everyday life to describe a momentous cultural evolution. This important book from a very talented European writer is highly recommended. Purchased at Prague Airport, 8 June 2007. Read mostly while waiting for flight to FCO and while in Rome for the weekend. Ever read one of those books that just totally wows you? Well this was it for me, it really opened my eyes. The author's intro really sets out her goals and aims for this project. Europe meant different things to different people depending on where they lived and where they were in life. There's a lot that is implied by just the word Europe, or Europa, but you need the context to fully understand it. A clear example of this was the stick/horse allusion. "If you asked a child riding a broomstick what it was doing, the child would answer, without hesitation: 'I am riding a horse.' ... And no one has yet told the infant Eastern Europe that a wooden stick is not a horse." It's almost as if by putting western names on their stores and businesses, they hoped to be Western but weren't aware that it was far more complicated then that. The same applies to Japan, and one wonders even today if that message has been received. Part of what intrigued me about this book was that I know/knew very little about Yugoslavia. I was just old enough to pay attention to goings-on in the world when communism collapsed and Yugoslavia eroded into the political mess that it still is today. The only contest I have for the former Yugoslavia is Monica Seles, the Balkans that I remember are Serbia, Bosnia & Herzegovina, Croatia, etc. It was interesting to learn that Yugoslavians enjoyed such relative freedom. I found the author's stories about the high cost of living in Croatia to be amazing. Eastern Europe is perceived as being cheap, it's almost impossible to imagine the idea of shopping in Vienna for 'bargains' especially in today's strong Euro. In the case of the Romanians and Serbs, electing leaders whose ideologies so closely resembled that of the communist leaders, it almost helps to explain the current state of Iraq. The Iraqis aren't sure what they want, and it's shown in violence. Contrary to popular belief, the US troops represent instability rather than the intended stabiliy. I knew Ceaucescu had been shot along with his wife, but I had no idea that Tito's wife JOvanka was still alive and living in Belgrade. Why was she allowed to live? What would the region have looked like if Tito hadn't broken with Stalin? PErhaps even better, why did Moscow allow it while at the same time feel threatened by the Prague Spring? I think it's interesting to wonder whether Tito would have been executed like Ceaucescu if he'd not died of his own health issues. Although these stories were written 10+ years ago, a lot of them applied to Prague and its current standing vis a vis its neighbours in Europe. It's been said that Vienna is Prague in 20 years, but Prague is the Prague of 1900 in that its finally regained its former standing in the world. In light of the changes I've seen in Prague in the last four years and the changes in the region as a whole, this was an excellent book to read. It will be interesting to see when and if the former Soviet countries do indeed become "European." Speaking now, I think it extends far beyond EU membership, as there are still differences between member states ex: Austria:Czech Republic: Poland. Always open, order subject to change but I will honor shipping prefs or advise you if I can't. Please PM me or leave a comment to join. Released into the care of Czech Post in Kutna Hora this afternoon. No idea how long mail between the Czech Republic and Scotland will take, but it's better than not getting to the post office in Switzerland or England. Wow this was a speedy arrival! Thanks to SKingList for this one and the funny postcard (content rather than pictorial elements). I have a few books in front of this but an unexpected day off work today. So I'm using it to catch up on some reading. I joined this ring because I returned from a week's holiday in Bulgaria in June. They're just joined the Euro and the typical saga of rising costs of living yet wages not rising to meet that standard has begun. One incident I empathised with was the philosophy of 'You have, I need' that was adopted in Eastern Europe. That completely defines the philosophy I saw displayed by child beggers in the city of Bourgas. Although my boyfriend and I are Westerns you could hardly describe us as well off. SkingList does a far superior review of this book. Unfortunately I was vaguely aware of the Balkans conflict in the '90s. The Berlin Wall fell when I was 4 years old so my knowledge of that stems from history classes or documentaries. My German History lecturer was fond of telling us the story of how he almost got arrested for throwing a banana peel out of a train in East Germany. It wasn't the crime of littering but more the danger of Eastern Europeans becoming aware of bananas. Does that make sense? Anyway this is a great little book. Even though it was written over 10 years ago, the issues highlighted are still relevant to Europe today. I posted this book off to Fifna via air mail today. Arrived safe and sound, thanks Drusillamac! A very interesting read. I've travelled in some of these countries, and it's good to get the inside perspective. Thanks for sharing, SKingList, I have rapturina's address and will send it on a soon as possible. Thanks for the ring, SKingList, I'm glad I got the opportunity to read this book! Sent on to aava this afternoon. I've got the Café here and will read asap. Thanks for sharing, this really looks interesting! This is a really fascinating book. I've also studied history (as a minor) and also something called the European integration studies and I even worked as a trainee in the European parliamentary.So I have had these questions put to me before, but I still don't know if I have any answers to them. I've also been fortunate to have lecturers from Estonia and Bulgaria during my university time, but this book gave me a lot more interesting background information. Draculic doesn't give easy answers and some of her own questions remain questions. She doesn't let herself easily, that is obvious and I appreciate her honesty and self reflection. At times she's quite brutal but then also has sympathy and understanding.The book has it's darkes tones but then there's some really black humour as well. An excellent book, one that more people should read. It doesn't feel outdated but I would like to read what the situatton is after a decade after this book was written. Thank you SKingList for sharing this book with us. I already have okyrhoe's address and will mail the book out tomorrow. I found this in my p.o. box today. Thanks SKingList for including me in the ring, and aava for posting it to me! As many of the previous readers have mentioned, this book is still relevant today. I read the book twice, and took many notes. The last passage was particularly poignant for me. I don't think we (Europeans) have adequately answered the concluding sentence of the book - the question of "What is Europe after Bosnia?" This is an issue that is particularly complex for Greece and the Greek people. Rather than being informed by the relatively recent events in our own national history (population exchanges, loss of homelands, loss of human life), we took morally questionable sides in the Bosnian crisis that occured practically 'at our doorstep.' I find it frustrating when I mention "Srebenica" to my fellow countrymen and more often than not, they have no idea what I am referring to. The manner in which Drakulic uses quotidian matters to illustrate the moral & political characteristics of Balkan history and the present situation is very enlightening. I was amazed to find myself commenting, as I read each thematic passage, "This is also true in Greece" or "Greeks think/behave the same way". It has made me re-think much what I took for granted as being unique to the Greek experience, with respect to the integration of our country into the European Union (a process which has been anything but smooth on a national level as well as for the average citizen). 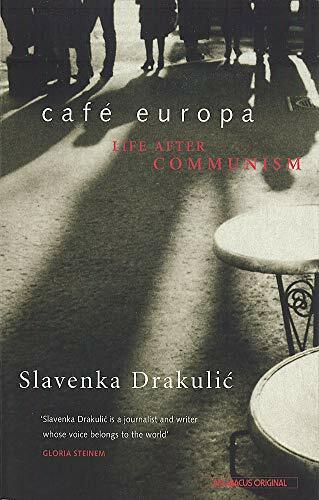 I would like to suggest Facing Athens as a counterpoint to Cafe Europa, a book which illustrates issues similar to those in Drakulic's book. One question I would like to ask the author (if she hasn't already written about this elsewhere): What conclusions can be made about communism and the post-communist years, with regards to the phenomenon of women from the former Eastern bloc becoming easy prey to human trafficking and the prostitution industry? On its way to voveryte in London. Have finished, will write a propper journal entry later, PMed loveamystery for the address. ETA 05 May 2008: Didn't have a chance to write a proper journal earlier, so here it is now. Since it was quite a long time ago that I've read it, it will be difficult to give a very detailed review of this. As coming from so called Eastern block country (Lithuania) I was hoping to find this book really interesting and close to me. Honestly, it didn' appeal to me much. I have realised once again how different we are/were from Balkans, both at the dawn of communism fall and today. Balkans have a very different history and cultural background which of course have influenced development of the region both during soviet times and after the fall of regime. Lithuania (as well as other Baltic states) was becoming a prosperous country before WWII, it's economy and market succesfully competing with that of Scandinavia. During WWII due to unfortunate circumstances and indifference of the rest of the Europe, Lithuania (as well as Latvia and Estonia) were occupied and incorporated into USSR, with suppressing it's fights for freedom and diminishing it's culture by deporting hundreds thousands of people to Siberia, continuing repressions for 50 years until restoration of independence in 1990. Since then the things have changed dramatically and I can't believe myself that nowadays we are more than ever similar to other european countries. However, other people's minds are broken down and generations will change until we all think like free people. Then there is always threat from Russia which it seems will never realise that those countries can not be it's autonomy, having different culture and language (which is not even Slavic). It was very interesting to read about Balkans, as they seem to have complex history, though different. And I would definitely wish to visit that region. Not because I am interested how the countries have been developing since the fall of comunism, but because the area and people are so different and interesting. It has arrived! Thanks voveryte for sending it all this way. This is a great book! Am still reading it, but hope to finish it soon. Wow! I am so glad that I had the opportunity to read this book. I learned a great deal and I am much more interested in these countries than I was previously. As well, we have three employees who were born in two of these countries, so it is even more interesting. Thank you SKingList for making this book available as a ring. Feb.25/08:elizardbreath has asked to be skipped. This book is now on its way to UnwrittenLibra by surface mail. Received today in the mail in Amherst, MA along with a nice RABCK from loveamystery! Thanks, loveamystery! Finished this book on Saturday. It was a very powerful book - Slavenka Drakulic is an extremely talented, artistic, and masterful writer. Some of the passages were very meaningful and drew me in. Others just dragged on. I felt that I had received the underlying message Drakulic was trying to prove about midway through the book and mostly skimmed the rest for the interest of time, and interest, because some passages bored me, but overall, Drakulic's book made me think about big issues in my own life, as an American (and a Jewish American at that) and want to learn more about the subject and about Eastern Europe in general. I have classicfox's address and will send within the week. Thanks, loveamystery and SKingList! Sent to classicfox yesterday from Amherst, MA. Happy travels book! Came today and will start reading today. Thanks for including me and thanks for sending, UnwrittenLibra. 4/12/08: I'm going to skim through this and send it on. Don't think it's going to hold my attention to the end, but will see. I already have duza-kaluza's addy and will send it soon. Mailed off today first class to duza-kaluza to continue the ring. wow that was fast! Looks like a good read. I'm so sorry I've had this book for way too long. I really enjoyed this book. Having lived in Poland for 10 years I could really identify with a lot of the issues that Drakulic mentions in the book. I first traveled to Central Europe in 1991. I was so fascinated by the area that I lived in Poland from 1996 to 2006 and it's really amazing how much has changed in that time. My father-in-law and his siblings who lived most of their lives under communism and now are among a kind of lost generation who are unable to adapt to modern day Poland. I don't know how many Café Europas I have spent time in, often elegantly decorated yet cigarette burns in the tablecloths! I could never understand why my husband would always get so upset and anxious when we were at a border crossing. Especially since we weren't doing anything wrong! I also couldn't understand why people didn't take care of their teeth! On a trip to Ukraine I discovered that having gold teeth was quite fashionable for the young and old! I first went to Yugoslavia in July 1991. The evening I arrived in Zagreb everyone was celebrating in the streets. The days that followed were the 11 day war in Slovenia. I've been back to Croatia and Slovenia many times since then. Istria is a magical place especially Rovinj. Thank you SKingList for setting up this bookring and sorry I've kept it for so long. Thank you Carrie for sending this out onto the world. It has been very interesting reading everyone's comments. The first couple of chapters failed to impress me, as I thought the tone was too mocking. But I was won over with her observations on the former Yugoslavia. I was born there, and visited in 1998 - very soon after the war. I think Drakulic has done a brilliant job of capturing the mood and hopelessness of the Yugoslav states in the 90s. The "My Father's Guilt" chapter was particularly gutsy and I applaud her challenging the Croatian government and media. I went there again in April of this year, and not much has changed in the ten years that this collection of essays was written. You can't just "get over" a century of identity-crises, authoritarian rule, mistrust, and fighting. I think it goes well beyond the 50 years of Communist/Socialist rule. There are just too many issues, too much history, too much ingrained culture, to be solved by a change of borders, or government. As Drakulic suggests, it will take generations. Anyway, a very interesting book. It's off to martinburo in the UK next. Thanks, I'll start reading now. I thought this was interesting and amusing and thoughtful enough, but I wasn't terribly impressed, because mostly it got stuck halfway between personal authenticity and observing the great overturning of half a subcontinent. It did offer some of these more interesting extremes. Of other people's comments I can identify with UnwrittenLibra's most, the good points that the others noted are really there, but I found them to be high points in an otherwise mediocre book. Going to mail this now.